When does a “pop up” park become a full on park? Does the size matter? The permanence? The use? Typically, pop-up parks tend to be fairly small — just a few thousand square feet, if that — but a few noteworthy ones show temporary places can be super-sized, too. 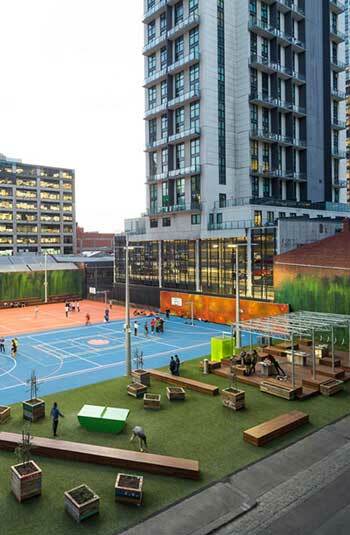 In Melbourne, Australia, RMIT University turned a 30,000-square-foot parking lot into a vibrant community space for a game of pick-up basketball or just hanging out. Designed by Peter Elliott Architecture + Urban Design, A’Beckett Urban Square shows the amazing potential of really any empty urban lot. At a cost of $1.2 million Australian dollars ($970,000 U.S.), the park is not cheap, but still less than a more fully-realized, permanent park. 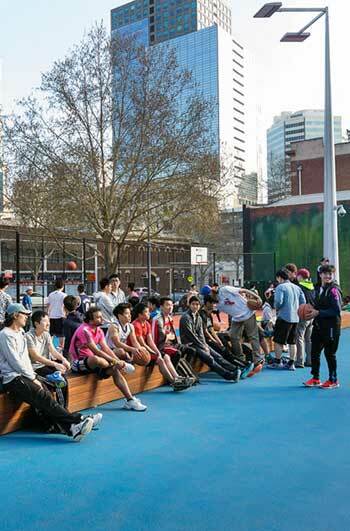 The designers told Landezine RMIT students and local residents can now take advantage of a multi-use sports court set up for basketball and volleyball and surrounded by spectator seating.